Sunset/sunrise on Chukchi Coast. Photo by Shelby Anderson 2012. 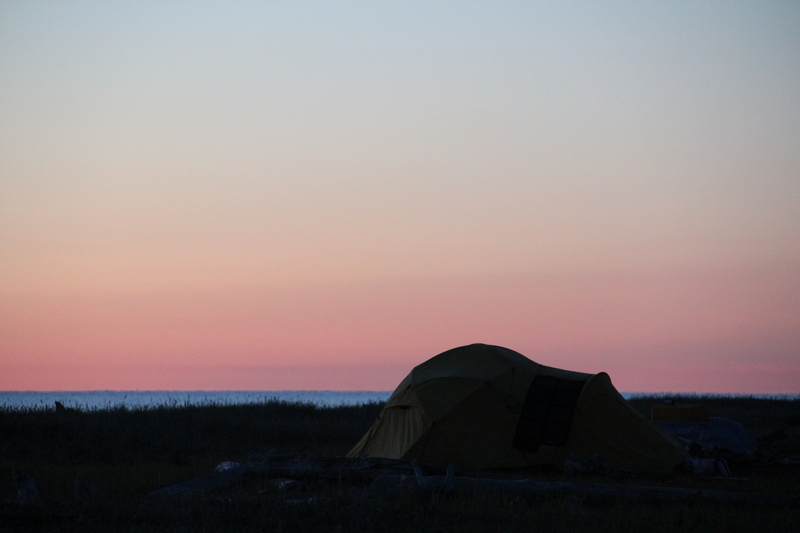 As part of my collaborative project with the National Park Service I led two weeks of fieldwork last summer on the northern Seward Peninsula Coast. I took a small team into the field to survey a section of coastline near the villages of Shishmaref and Wales. We had three goals: 1) to look for previously identified and new archaeological sites, 2) to document and test sites to collect information about site age and use, and 3) to document impacts to the sites (e.g. coastal erosion, wind erosion, animal disturbance, etc. ), with a special focus on potential climate change impacts to archaeological sites. Although we struggled with the usual rugged coastal weather of northern Alaska, the trip was a success. We re-located all of the known sites, found some new ones, and collected many samples for dating and to learn more about past life at these sites. There is much to say about the site and project in general, but right now a lot of the work is focused on cleaning, cataloging and analyzing all of the materials we collected last summer. Much of this is being done by students. They are writing a series of posts about their work…first one coming up soon. This entry was posted in Fieldwork and tagged Alaska, Climate change, Fieldwork. Bookmark the permalink.